Public Speakers Want To Know: Are Handouts Your Friend Or Foe? Are you going to be competing with your handouts for your audience’s attention? How much information is there going to be in your next speech? Most of the speeches that we give are full of great information that our audiences would like to remember and follow-up on — your audience understands the importance of public speaking and that’s why they are there. That’s where the problem shows up: when a speaker provides his or her audience with a handout there’s a good chance that you are going to lose their attention. What’s a speaker to do? Although the handout that you’ve created for your audience may be full of great information, you are facing a serious problem when you get ready to hand it out to your audience: should you give it to them before you speak or after you speak? If you give your handout to your audience before you deliver your speech, they may spend their time reading your handout and not paying attention to you. Additionally, if like most of us you just print out the slides that you will be presenting and give it to your audience as a handout, then they’ll always be two slides ahead of you and still won’t be paying attention to what you are saying right now. If you decide to avoid this situation and distribute your handout after you are all done giving your speech, then do you really think that anyone is ever going to take the time to look at them? For that matter, where did your audience write down the notes that they took during your speech – was the information that they were trying to remember available in your handouts? One way to deal with this problem is to use a combination approach: provide your handouts to your audience as you reach that point in your presentation. Clearly this takes some effort and the rustle of papers being handed out over and over will tend to take away from your speech. However, the benefits can be enormous. Since each handout will show up just when you start to talk about what’s on it, your audience will have no problems making their notes on the correct handout. Limiting the handouts that they have to material that you’ve either already talked about or are just getting ready to cover prevents them from jumping ahead of you. 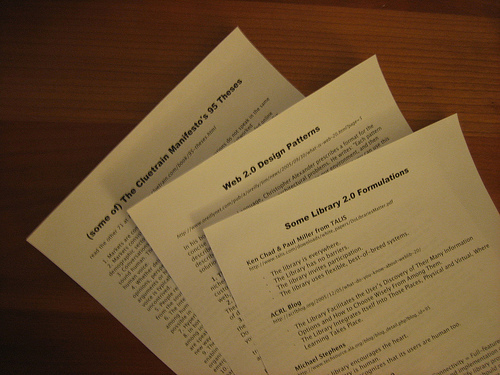 Another way of making it so that you can use handouts with your next presentation without taking away from what you are saying is to use the fill-in-the-blank technique. This approach is a less disruptive than the one-at-a-time technique. When you use the fill-in-the-blank technique your audience will be handed a complete set of your handouts before you start to speak. However, the handouts that they receive will be incomplete – information will be missing. During your presentation you will show slides and you will discuss issues that contain the information that is missing from your audience’s slides. As you do this, they can write down what you’ve just said and when your speech is over, their handouts will be full of valuable information. This approach allows you to strike a balance between making sure that your audience has the information that they’ll need in order to remember what you said while not allowing your handouts to distract from the speech that you are giving. No solution is perfect, but this technique seems to do a good job. The benefits of public speaking include sharing the information that we have with our audience. Sometimes we have so much information that some form of a handout is called for in order to help our audience to remember everything that we’ve told them. The problem with handouts is that they can distract our audience from paying attention to what we are saying. There are several different ways to deal with this problem. The first is to hand out the different pages in the handout as you reach that point in your speech. Another approach is to remove important information from each slide and force your audience to pay attention in order to fill out the handouts. Handouts are becoming a more and more critical part of every speech that we give as we load our speeches up with additional information. Give some thought to how you want to share your information with your audience while keeping their attention throughout your speech. Question For You: How many pages do you think that you need to limit your handouts to? I’m pretty sure that it would be safe to say that we’d all like to become better public speakers. The challenge that we face is that nobody is just exactly sure how to make this happen. I’d like to be able to tell you that because of the importance of public speaking, it’s easy to become better, but the truth is that more often than not it takes some stressful circumstances to help us to reach the next level.